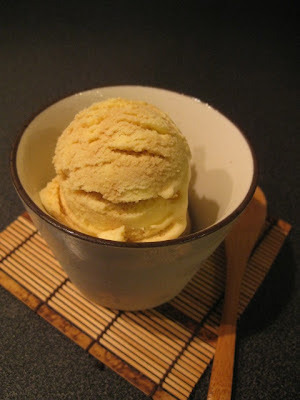 Here's my Saikyo Miso & Soy Milk Ice Cream. If you prefer your ice cream to be made with cow's milk, you can certainly use it instead of soy milk. Miso is added at the very end of the cooking process, so the flavor and good enzyme of the miso stay alive when the ice cream is ready. It's one of the most popular ice creams I make at home. 1. In a pot, combine soymilk, heavy cream, and honey. Scald over low-medium heat. Turn off the heat. 2. In a large bowl, whisk the eggs. Gradually add the scalded liquid as you whisk, so that the heat won't coagulate the eggs. 3. Transfer the mixture to a clean pot and scold again over low heat. Turn off the heat and strain through a fine-mesh sieve into a bowl (this is the custard). 4. In a separate bowl, add the saikyo miso and gradually whisk in the strained custard. Refrigerate the mixture until very cold for a few hours or longer. 5. Set the mixture into an ice cream machine to finish.